iPhone and iPod users of all generations who have Jailbroken their devices to get your hands on the extra bit of tweaks and applications which are not available in iTunes App Store and available in Cydia. As Apple is very strict with the developers and approves only Apps which it feels are good and not a threat for them unlike Android which gives full freedom to its developers. So for iPhone and iPod owners who have Jailbroken their devices and are in need to remove their Jailbreak and Unlock and return their devices to the original Settings there is an easy way to do it as described below. You feel your device Hardware is being affected by using all the unofficial Apps around and making it slower by the day. When you have a problem in your device and have to give it in the Apple Store for a Servicing. When you have to sell your iPhone to someone. If you are in another country and your original network provider from whom you have got the iPhone is not present in your country. If you want to Jailbreak and Unlock your iPhone again you have to look into whether there is a Jailbreaking Software available for the latest firmware. And you will be relieved to know that reversing or removing the Jailbreak is a very simple process compared to the laborious process of Jailbreaking and Unlocking of your iPhone or iPod. Connect your iPhone or iPod to your Windows PC or Mac using a USB cable. Then your iPhone or iPod can be seen in the left side column in iTunes and on the top you will be seeing Automatic Backup which can be either cancelled or let is complete to save your data in your iPhone.? 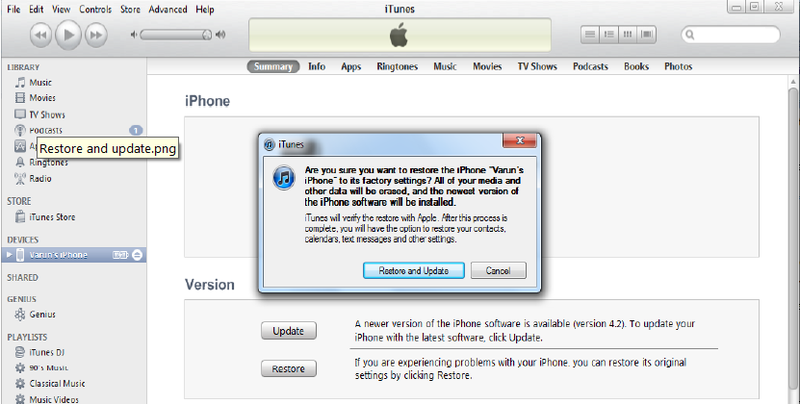 Click on your iPhone or iPod device seen in the left column of iTunes in your Windows PC or Mac. Then you can see two Options Update and Restore. Then you will have to click on the Restore button. Then there will be another box opening which will be showing two options Backup or Don’t Back Up before restoring the software, so you have decide what to do, if your iPhone is already Backed up then you can go with Don’t back up but if u are not sure about the Backup earlier you can select the Backup now. After this step is finished there will be another box opening which gives the options Restore and Update and Cancel as shown in the image given below. 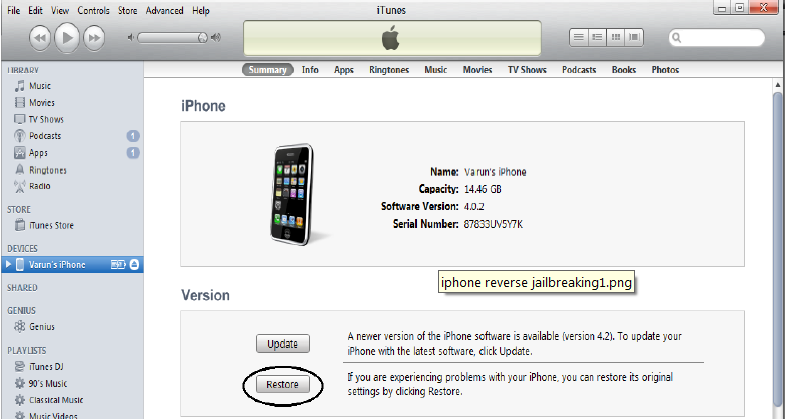 Restore and Update option will Restore you iPhone or iPod to the Factory settings and will start download of the latest Firmware and update it to it. This might take a while as your iTunes will start downloading the latest Firmware for your Device which can surely take a while. Then after you have completed all the steps without any interruptions you will be having your iPhone or iPod which were earlier Jailbroken and Unlocked will be brought back to their Original settings or Factory Settings.